I had noticed in the local press that Fife’s ice-hockey club Kirkcaldy-based Fife Flyers had just been admitted to the UK Elite Ice Hockey League, so thought I may wander along to lend my support. After all, if the locals do not support a club who will? I enquired of the family if anyone wished to tag along, with perhaps predictable results. Son did his shuffling, hesitant “Do I have to?” thing, whilst Daughter (less reticent about hurting my feelings) just performed her slightly crimped mouth thing and, staring at me with one eyebrow raised, replied rhetorically “What do You think” Wife also turned me down, commenting in her usual incisive and unerringly perceptive manner about ice-hockey being just “Blog Barrel Scraping” or some-such. Don’t you just hate it when folks can read you like the proverbial. 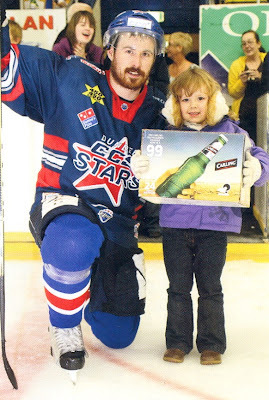 I had never been to an ice-hockey match before, but like most people, I suppose, had watched it on TV from time to time; usually at the Winter Olympics. It was one of the few sports my Dad (a committed sportophobe, generally) would occasionally sit down and watch on TV. The other, somewhat bizarrely, being the pantomime wrestling ITV used to show on Saturday Afternoons. He used to do a bit of skating as a lad. I know because there were old Herman Munster-ish ice-skates in a cupboard at home when I was growing up, and I have often wondered since if he ever played ice hockey. One of the million things I should have asked him before he died, I suppose. Anyway, last night I scooted along the A92 to Kirkcaldy, being pleasantly surprised on arrival at the number of parked cars and milling folks around the Ice Rink. I had a brief choke when the drop-dead gorgeous oriental girl at the entry booth asked me for what I thought was £50 to get in. Huh? Just a trick of her accent and my failing ears, thankfully. It was actually £15 – still a surprisingly hefty fee, I thought. Don’t expect much of an analysis of the match here – I am a stranger here myself, but what became apparent within a few minutes was that the sky-blue clad Coventry Blaze were a class above the home lot. Seemingly able to glide around with effortless ease, I don’t think they let a Fife player near the puck before scoring within 90 seconds through Mike McLEAN. And that pretty much set the pattern for the first period, although the fact it was only 2-0 at the (first) break was down to home net-minder (I am getting into the lingo), Canadian Garret Zemlak, who must have stopped a dozen point-blank attempts at goal. The Flyers improved as the match progressed and carved out a number of breakaway chances, but could convert none. I began to realise that what with the tiny target, and the extensive padding of the minders, shooting direct at goal, even on a one-on-one situation had little chance of success. The most productive method appeared to be to crowd as a many players around the opponents’ goal as possible, then whack the puck in their direction hoping for either a deflection, or to take advantage of a rebound from the netminder. Both the visitors' goals arrived this way: a chap with the great name of Owen FUSSEY having notched Coventry’s second. netminder Peter Hirsch looked troubled. each break, and I would have paid for a shot. Wandering around the arena during the breaks it became apparent Fife Flyers were very much a club looking to maximise any and every fund-raising opportunity. There was a club shop selling all a manner of logo’d paraphernalia, programme sellers, a wee lassie doing a roaring trade in crisps, sweets and cola from a table, and another bunch of folks selling 50:50 Club tickets. There was also a queue of kids buying what looked to be numbered pucks, the reason for which was not immediately apparent. Behind the opposite goal, a Supporters’ Club (effectively a cordoned off area with a bar in), was doing its best to administer to the needs of those individuals requiring something a touch more stirring than Irn-Bru. 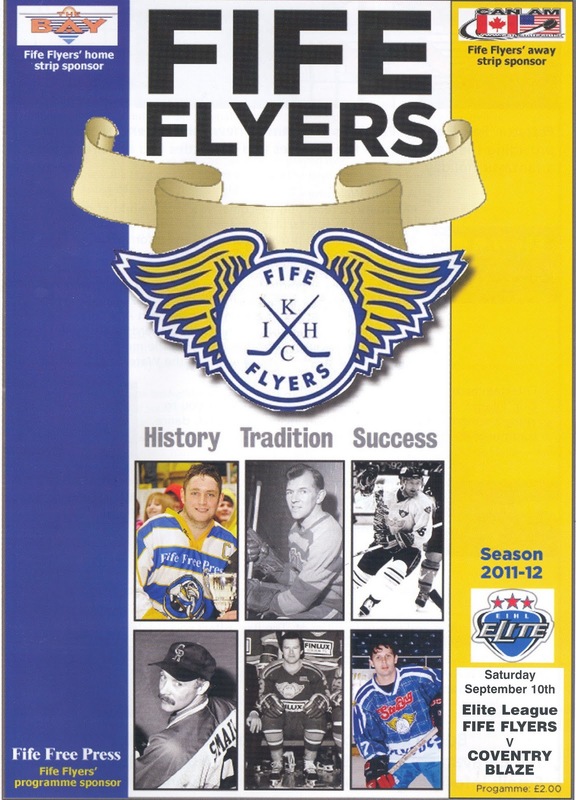 All-in-all it was quite a fun evening and Fife Flyers, although clearly inferior to their guests, by no means disgraced themselves – although in the return fixture, the following evening in Coventry, they were whupped 9-0. Would I go back again? I probably would, but a £15 a pop, not terribly often. The Flyer’s extensive fixture list of 56 league and cup matches did, however, ford multiple opportunities to lend my future support to the club at visits to Dundee, Edinburgh and beyond. 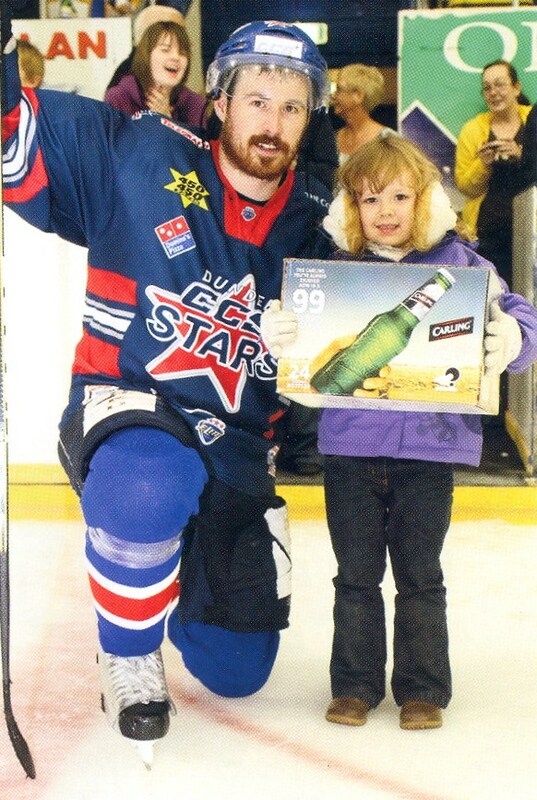 This was an odd uncaptioned picture from the programme - either the girl is presenting the player with a man-of-the-match award, or she has just won a totally inappropriate raffle prize. Knowing Fife as I do, it could easily be the latter. Flyers on the attack, but not really managing to threaten. A difference of opinion against the plexi. onto the ice, and two kids skated around to pick 'em up. No idea what was going on - perhaps closest to the centre spot won a prize? Panorama from behind one of the the goals. Thanks for your comment - yes, I would imagine geography limits your opportunities to drop in to support the Flyers these days.